kāhili: 1. Feather standard, symbolic of royalty; segment of a rainbow standing like a shaft (also a sign of royalty); to brush, sweep, switch (to spray, as in kāhilihili: Kāhilihili ke kai a ka he’e nalu, spraying sea of surf-rider). Kāhili chants (As in ‘ou’ou, to describe the pinnacle or high peak): I ka lālā wēkiu ka pua o Lono, i ka ‘ou’ou o nā lani nui, in the topmost branch the flowers of Lono, among the highest of the high chiefs. 2. 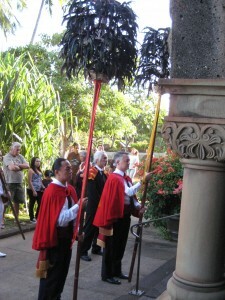 Pa’a kāhili, kāhili bearer. Kū kāhili, one standing by a kāhili or carrying it. Kāhili pulu, to clear away mulch. Haku ‘ia na’e ho’i ka hulu o ka moa i kāhili i mua o nā ali’i; kāhili ‘ia na’e ho’i kō kua, chicken feathers indeed are woven into a standard for the presence of the chiefs; your back is brushed by the kāhili. ho’okāhili. To brush or fan gently. 2. The crape myrtle (Lagerstroemea indica), an ornamental shrub from China, with small oval leaves and panicles of pink, white, or purple crape flowers. 3. A small tree (Grevillea banksii) from Australia, related to the silky oak, ‘oka kilika, but the leaves with fewer subdivisions and the flowers red or cream-white. This is a later application of kāhili to a plant. 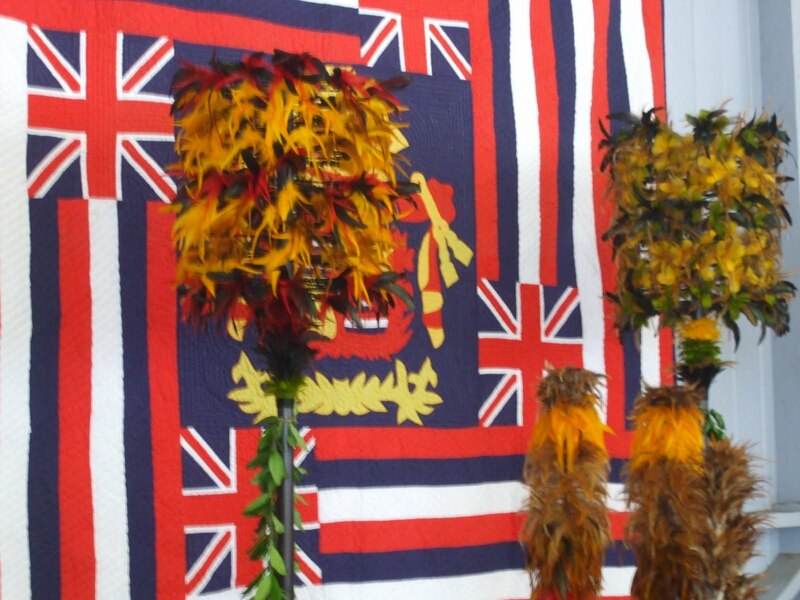 Flowers not used for leis on head or around neck because of irritating hairs, but made into leis for hats by sewing alternated rows of flower clusters and own leaves on pandanus band. 4. 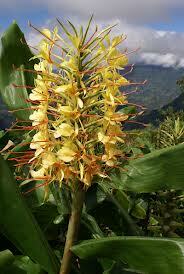 Kāhili ginger (Hedychium gardnerianum), from the Himalaya region; much like the white ginger but with a more open flower head, the flowers with narrow yellow segments and one bright red stamen apiece. Also ‘awapuhi kāhili. 5. A seaweed, probably Turbinaria ornata.